I don't know about you but I love to get to the airport early to have a look around the Duty Free and sit and relax before a flight. I've become a bit of a nervous flyer as I've gotten older and so being there with plenty of time to spare just makes me feel so much more at ease. JFK is one of the best airports I've been to, there's lots of shops and places to eat and it makes all the difference especially before a long flight because there's a lot to keep you occupied. I wanted to pick up a few presents for people and didn't really have any intention of getting anything for myself after clearing out the Glossier Showroom and Sephora. 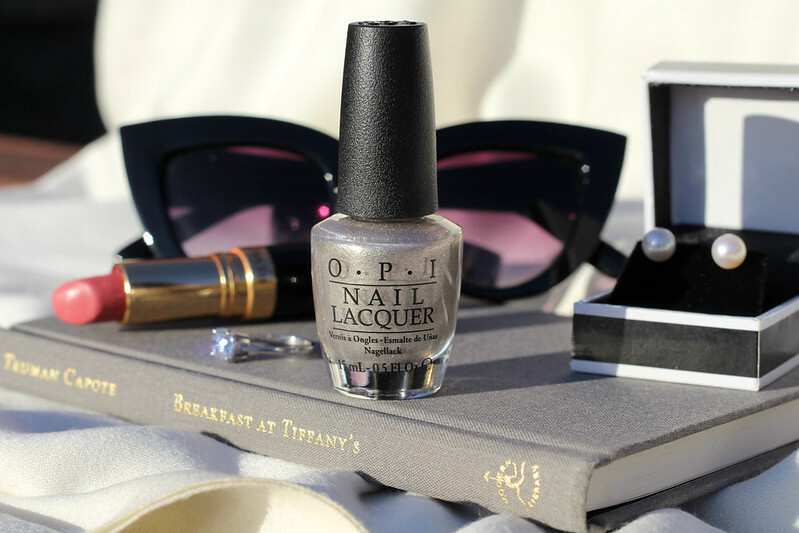 I was browsing the OPI stand and I noticed they had a Breakfast at Tiffany's collection which I've since learned was their Holiday 2016 collection. I hadn't heard of it or seen it anywhere even though we now have OPI here in Ireland. 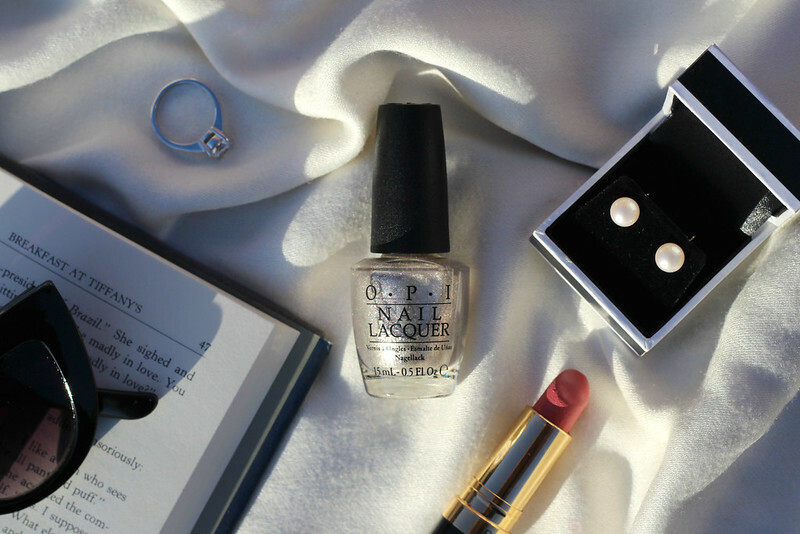 I don't tend to keep with with nail polish brands as much as I used to but OPI are one of my favourites along with Essie and they always do great collections. I had a look at the shades and there were a few I liked but I ended up buying Five-and-Ten which is a champagne/silver shade with micro glitter. 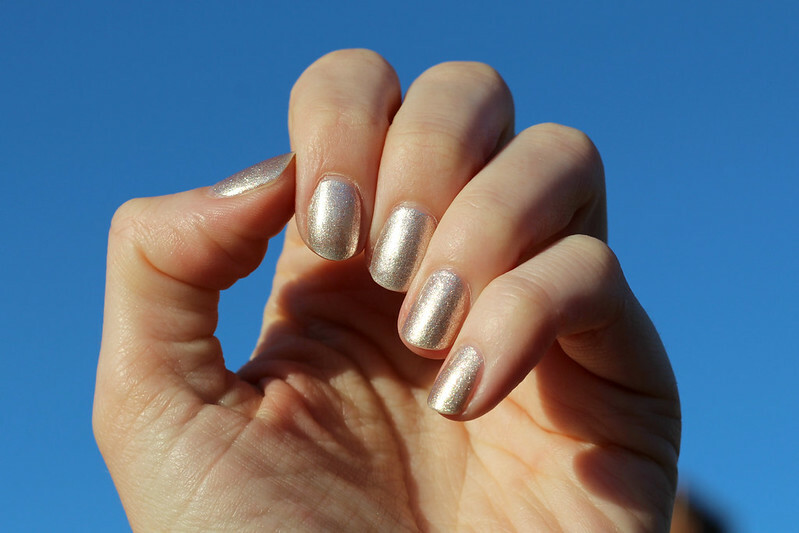 It's such a pretty shade that looks gorgeous under lights or in the sun and the glitter is quite inoffensive so it could act as a nice neutral too. I love the OPI nail polish formula, I find it so easy to apply and like Essie they have a bigger brush that I prefer for my nail shape. I had a look around online and the collection doesn't seem to be available in that many places anymore. A lot of websites won't ship nail polishes outside of their country but I found this shade here and here on sale! Some of the other shades are available on Nail Polish Direct and HB Beauty Bar as well as on Amazon and eBay. I also bought the set of 4 mini shades for my mam and sister and I kind of regret not buying one for myself. I bought another OPI polish from Rite Aid while I was in New York so I'll share that one soon too because it's part of their permanent line. It's seems my not buying nail polish spell is over!